This shows two fictitious spacecraft about 5,800 km above the Earth. The spacecraft were an initial experiment with POV-Ray objects. This revised version uses the Earth map with clouds from NASA's Visible Earth web site. This depicts the Federation starship U.S.S. Horizon (NCC-173) in presumed space trials near Jupiter around the year 2162. The Horizon model was assembled from object in POV-Ray based on assorted diagrams from canonical Star Trek sources. The Jupiter map is from the Cassini web site (representing its appearance during the flyby in December 2000). The map was missing data near the poles, which I filled with a single color from a nearby region. This view shows the NCC-1701 U.S.S. 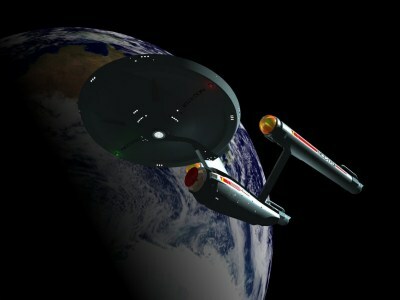 Enterprise above the Earth. 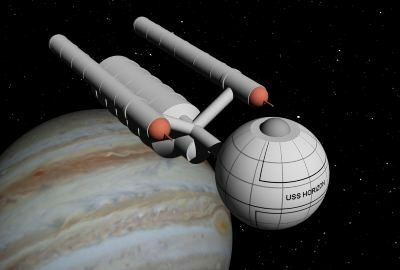 The model of the Enterprise is a fine one by Jeff Lee. The Earth map is from NASA's Visible Earth. 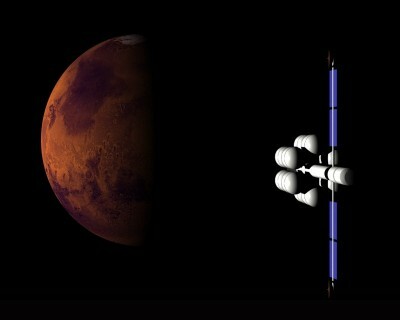 This shows a hypothetical manned spacecraft approaching Mars. The descent craft is visible at the near end, next to the crew modules. 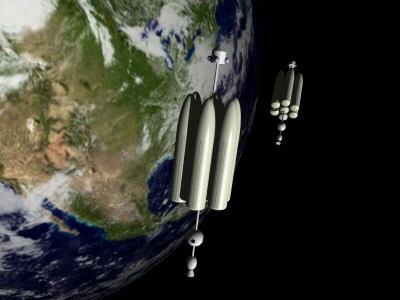 On the opposite end, behind the fuel tanks, is the nuclear thermal engine. The spacecraft is a preliminary construction in POV-Ray. The Mars map is from the USGS Flagstaff web site. 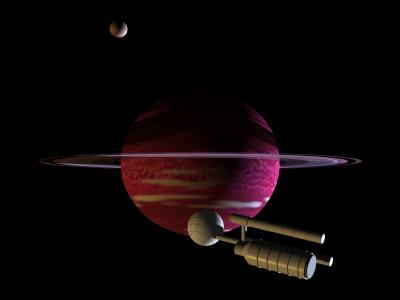 This is a hypothetical view of a Daedalus-class starship investigating a brown dwarf in a double star system. The brown dwarf, about 600,000 km distant, is a companion to a red dwarf star off to the left of the field of view; the two in turn orbit a more distant A-type star, illuminating the scene from the right. The spacecraft is the same construction used above. The brown dwarf map is based on the Neptune map by Don Davis (found at the Solar System Simulator web site) with the colors modified. The moon in the foreground is based on the Triton map used elsewhere on this site, also with colors altered. Starlight colors are based on information from What color are the stars? These two views show Ringworld, described in Larry Niven's 1970 novel Ringworld. 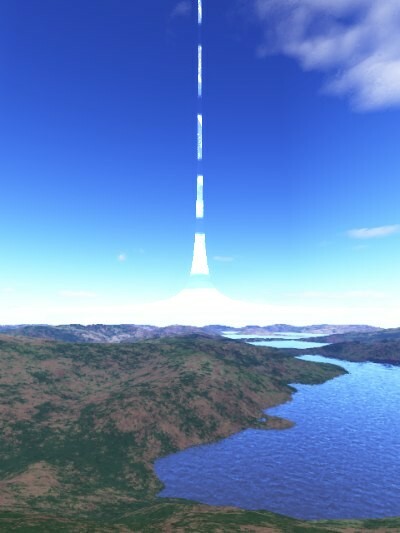 Ringworld is a 1,600,000-wide strip encircling a Sun-like star at distance about the same as the Earth-Sun distance. This strip is rotating about the star fast enough to simulate Earth-like gravity and has 1,600-km high walls at the edge. Thus the star-faced side of the strip is a habitable surface about 302,000,000 times the surface area of the Earth. A series of "shadow boxes" encircling the star at a closer distance rotates the opposite direction to cast shadows, providing "night". 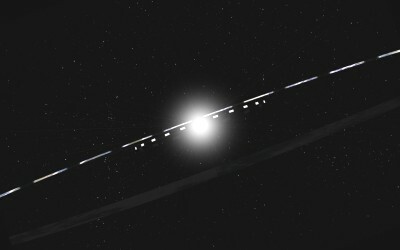 The first view is from 200,000,000 km from the star and shows Ringworld and the shadow boxes. The second view is from the surface of Ringworld. Looking along the inside surface, the Ringworld can be seen curving up at the horizon to wrap around the central star. These are experimental renderings of Ringworld. The first includes a sunburst effect added with Paint Shop Pro 7. The second merges an image from POV-Ray with one produced with Terragen. Last modified 15 June 2002.